The Management Team of Woodland West has quite a bit of experience behind them. They have all been with the Woodland West family for many years and have been instrumental in producing the excellent facility we currently have. They are a dedicated team of professionals, committed to excellent customer service and providing the absolute best in pet care. Individual profiles are available below. Please feel free to contact them at the individual e-mail addresses. Summer started her career with the Pet Resort as a Kennel Technician in 2003 and rapidly moved to Customer Service Representative. She then made the jump to Manager in 2007. 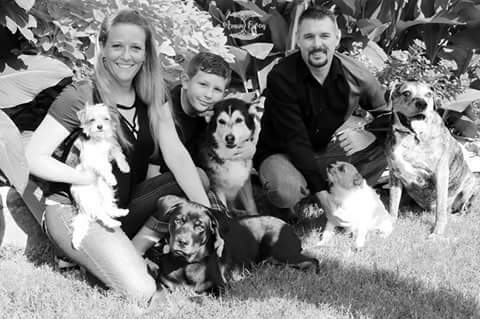 She has been certified in Advanced Pet Care, Canine and Feline Pet Care, Basic Canine Specialist, Basic Feline Specialist, and is a certified canine and feline provider. Her extreme dedication to animals has made her an awesome leader our management team. Summer has a wonderful husband named Ray and an adorable human son named Daymond. In addition, she has 4 four-legged children: Batista, Tally, LuLu and Sugar. Kent is a co owner along with his parents Dr. Ross Clark, Linda Clark, and manager Summer Brown. Kent moved back from college early to help run daily operations and marketing for Woodland West back in 2016. Kent graduated with a degree in business administration and marketing. Kent has a house on Woodland West’s 80 acre campus with his sidekick Ronan the golden retriever. Amy has been with us for 6 years. She is a wonderful asset to our team and can brighten up anyone’s day when working the front desk. Her dedication to Woodland has been above and beyond expected by attending extra training and seminars to further her education in customer service. She is just recently married and is owned by 3 dogs Wizz, Weezy and Iggy.